For some reason recently, my poor old Sony Vaio desktop PC is beginning to struggle. I’ve been getting relatively frequent messages telling me my Windows swap file is too small, for one thing. It’s also taking quite a while to perform several operations. Sometimes that doesn’t matter ‘cos I can just pop downstairs and make a cup of tea. Sometimes it doesn’t matter ‘cos I can pop downstairs and make an espresso. Sometimes it does matter ‘cos I don’t want any tea or coffee. Its struggling is hardly surprising, I suppose, since the poor old thing has a mere 500Mb of RAM. I could double the RAM to 1Gb but that’s the limit it can support. My poor old machine still runs Windows XP and I’ve been resisting a new computer, partly in a desperate attempt to avoid the dreaded and, apparently, very resource-hungry Windows Vista, partly because I’m keen to avoid the hassle of re-installing all my software on a new machine. Be that as it may, I’ve spotted what look like some reasonable deals on much more powerful machines of late and I must confess that they have been turning my head. So, today we went out for a look around PC World. I spied an Acer Aspire that I liked the design of. It sports 4Gb RAM and has a very respectable 640Gb hard drive, all of which should do nicely until Bill blasted Gates figures out another Windows generation to chew all that up and spit it out. What I really liked, however, was the clever placement of four front USB ports. They are positioned on the top of the case, about 10cms back from the front edge and angled slightly upwards making them very accessible from a chair when the machine is standing on the floor, as would be the case in my situation. The USB ports are perfectly placed for iPods and pen drives. Other designers should take note. I wandered away to consider my options. After all, it’s nearly £500 and we’ve only just splashed out on a new TV. Another large purchase after only one week is not my natural style. As we were beginning to head home, Carol waited for me to get in the wrong lane and then exclaimed that she’d like to look at some road bikes. Mea Culpa, I’m afraid; late last year I had expressed interest in a road bike for myself to augment my mountain bike. I seemed to have planted a seed which had germinated. We had a brief look in Halfords but, not only do they have very few adult road bikes on display, they seem reticent to let one try them out. They seem to expect people to part with £500 on spec. without checking either size or comfort. We left and went on to Phil Corley which is a much more professional organization, has a large range of all types of bikes and is happy to let you ride up and down the road on them. Mr Corley was, like many other bike shop owners, a successful cyclist and clearly sells to people who are more than occasional leisure riders. Were I to spend £4,999.99 on a bike I would expect an engine! 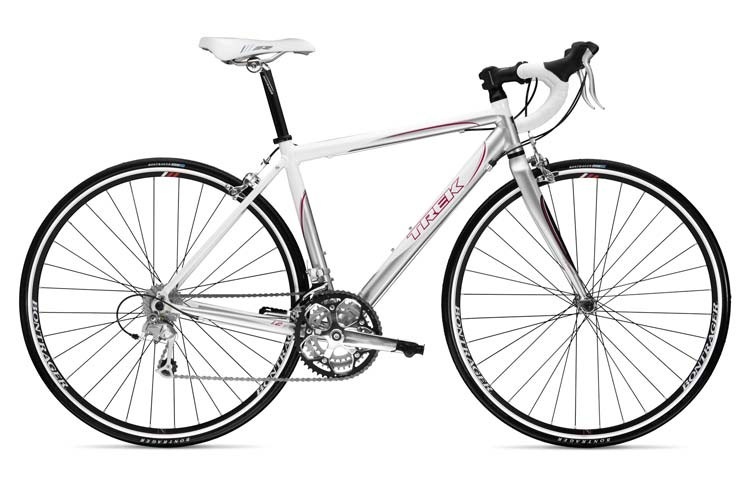 For somewhat more than the computer which I very frugally didn’t buy, there was a particularly sleek-looking Trek1.2WSD road bike designed specifically for ladies and which, as luck would have it, had just the right size frame for Carol. Somehow, this smart new machine has ended up in our garage. I think I’d better order that 1Gb of RAM.